It's more than beer. It's community. Three Weavers Brewing Company is an independent craft brewery, based in Inglewood, California. Founded in 2013, we are deeply rooted in responsibility - to our environment, to our industry, to our community, and to our team. Three Weavers exists to share our passion for craft beer - join us and become a member of our community. AS FOUNDER, LYNNE LEADS THE THREE WEAVERS TEAM AND ALL ASPECTS OF THE BUSINESS, INCLUDING OPERATIONS, SALES AND FINANCE. AS A HOMEBREWER, SHE LOVED SHARING HER BEERS WITH FAMILY AND FRIENDS. IT WAS AT THESE GATHERINGS THAT THE IMPORTANCE OF THE RELATIONSHIP BETWEEN BEER AND COMMUNITY CAME TO LIGHT AND THREE WEAVERS WAS BORN. 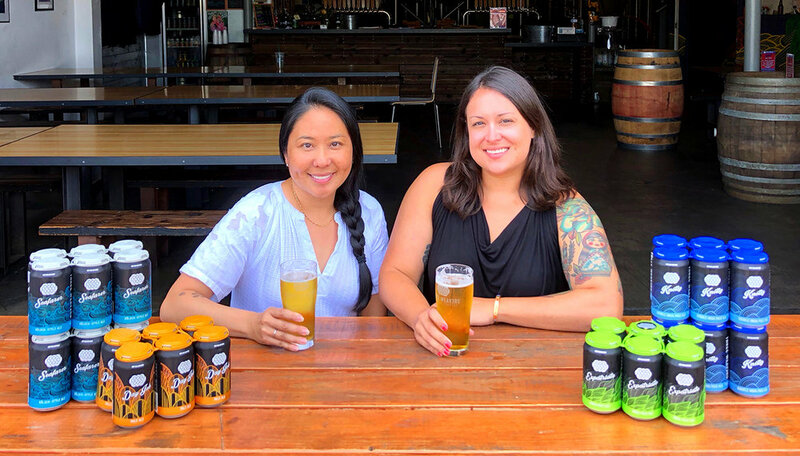 FOUNDED ON THE MISSION TO PROMOTE A POSITIVE SENSE OF COMMUNITY THROUGH OUR PASSION FOR CRAFT BEER, THREE WEAVERS BREWING COMPANY WAS FOUNDED IN 2013. IN ONLY FOUR YEARS, LYNNE HAS GUIDED THE GROWTH OF THE THREE WEAVERS AND ESTABLISHED THE BREWERY AS ONE OF THE LARGEST, INDEPENDENT CRAFT BREWERIES IN LOS ANGELES COUNTY. AS BREWMASTER, ALEXANDRA NOWELL LEADS ALL ASPECTS OF THREE WEAVERS BREWERY PRODUCTION. ALEXANDRA BEGAN HER CAREER AT SIERRA NEVADA BREWING COMPANY THROUGH A HIGHLY DESIRED INTERNSHIP AT THE CHICO BREWERY. AFTER A YEAR OF TUTELAGE AT SIERRA NEVADA, SHE MOVED TO MOYLAN’S BREWING COMPANY, WHERE SHE DWELLED IN THE CELLAR AND CUT HER TEETH ON BREWERY PRODUCTION WORK. IN 2010, ALEXANDRA JOINED DRAKE'S WHERE SHE CONTRIBUTED TO A 100% INCREASE OF BREWING PRODUCTION IN THREE YEARS, AND WAS ALSO RESPONSIBLE FOR THE BARREL-AGED PROGRAM THAT'S STILL IN PLACE TODAY. FROM DRAKES, ALEXANDRA BECAME HEAD BREWER AT KINETIC BREWING, LOCATED IN LANCASTER, CALIFORNIA WHERE SHE WON TWO MEDALS AT THE 2013 GREAT AMERICAN BEER FESTIVAL. IN 2014, ALEXANDRA JOINED LYNNE WEAVER TO LAUNCH THE THREE WEAVERS BREWING COMPANY. IN SEPTEMBER 2014, SHE BREWED THREE WEAVERS FIRST BATCH OF CRAFT BEER AT OUR INGLEWOOD, CALIFORNIA LOCATION. IN A SHORT FOUR YEARS, ALEXANDRA HAS LEVERAGED HER BREWING PHILOSOPHY OF 'RESPECTING THE INGREDIENTS' TO ESTABLISH THREE WEAVERS AS A LEADING, INDEPENDENT CRAFT BREWERY – WINNING MEDALS AT MAJOR INTERNATIONAL BEER COMPETITIONS – INCLUDING A GOLD MEDAL AT THE 2016 WORLD BEER CUP, A SILVER MEDAL AT THE 2017 GREAT AMERICAN BEER FESTIVAL, A BRONZE STAR AT THE 2017 EUROPEAN BEER STAR, AND CHAMPION INTERNATIONAL BEER AND BEST IPA AT THE 2018 AUSTRALIAN INTERNATIONAL BEER AWARDS. Yes, I verify that I am over 21 years old.